Mary L. Schmidt writes under the pen name of S. Jackson, and she is a retired registered nurse, who won the coveted Leora B. Stroup Bachelor of Science in Nursing Award for outstanding clinical performance, community involvement and academic achievement in Nursing Award, while at Fort Hays State University. She is a member of the Catholic Church, and has taught kindergarten Catechism; she has worked in various capacities for The American Cancer Society, March of Dimes, Cub and Boy Scouts, (son, Gene, is an Eagle Scout), and sponsored trips for high school children music. She loves all forms of art but mostly focuses on the visual arts; amateur photography, traditional, and graphic art as her disabilities allow. She has published fifteen books since retirement; the first a memoir, When Angels Fly, followed by an Art Picture book featuring her own works of art, one cookbook, and thirteen books for children of which seven are a part of a full series. Protecting children from molestation is important to her, and with that in mind she wrote Suzy Has A Secret. 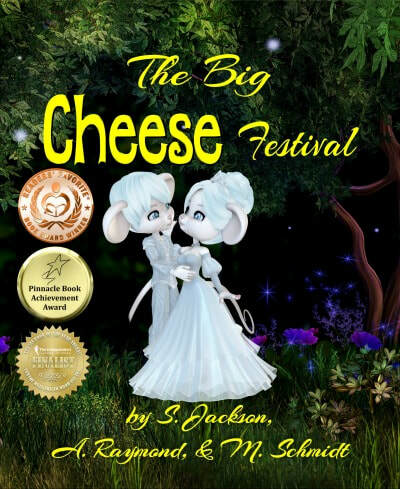 Seeing what bullies can do to a child inspired her to write the book, The Big Cheese Festival. Schmidt has designed all of her book covers. 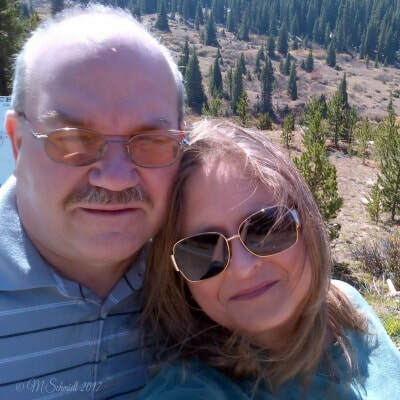 She loves spending time with her husband (and co-author under the pen name A. Raymond) Michael, and especially their first grandchild, Austin, age two years. She is a Member of the Society of Children’s Book Writers and Illustrators: The international professional organization for writers and illustrators of children’s literature, and Sigma Theta Tau International: The Honor Society of Nursing, which is the second-largest nursing organization in the world with approximately 135,000 active members. When Angels Fly is a true story of survival fraught with tragedy that will hold your soul. In utter sadness, great hope & faith grows. This is the inspirational story about a woman who was able to rise above an extremely abusive childhood and later marriage, to learn faith, love, and motherhood from her own son’s courageous fight with cancer. It provides an illuminating example of how women who are in physically, mentally and emotionally abusive relationships can successfully escape even in the most challenging of times. It also warns of how the actions of medical professionals can be a soothing balm or a deadly arrow. 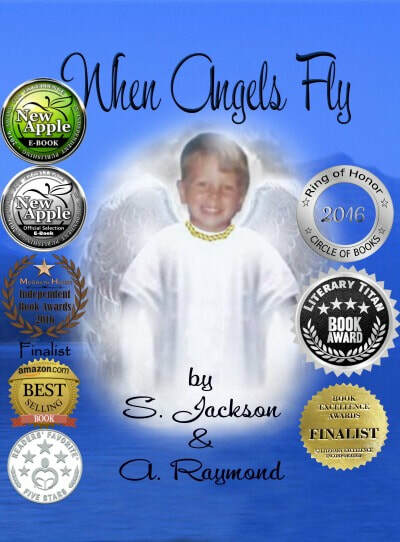 The story draws the reader into the life of a mother and her wonderful little boy who is strong beyond his years and who leaves a lasting impression on all who knew him. This book is about how one small dog, a baby squirrel and his mama squirrel become best friends. A baby squirrel is lost and found safely. This story book helps children to learn how to be safe when they are outside their home and illustrates that children always need to keep the adults in their lives aware of where they play and how to stay safe. “How a Dog and Two Squirrels Become Best Friends” was an enjoyable read from the first page. One would never think that a dog would not only befriend a squirrel but help him. I was reading with a smile on my face. I will certainly read this story to my grandchildren and buy as a gift for others. This would make a wonderful children's story for my church. Thank you for your efforts in making this a lovely book. 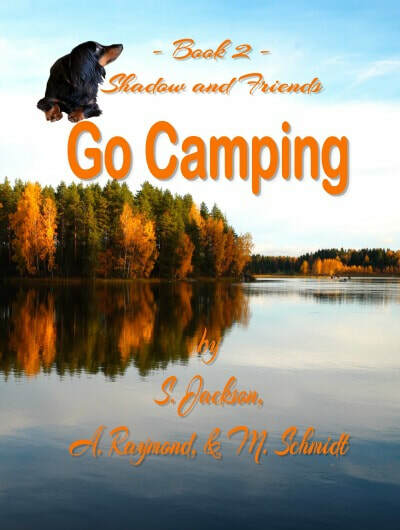 The graphics are awesome..."
This book is about how Shadow, a small dog, and his three squirrel friends, Big Whitey, Little Whitey, and their uncle Stubby, go on a camping adventure. This story book helps children learn camping and boating safety, and it also illustrates why children should always listen and learn from the adults in their lives. This story is about a ground squirrel that lives in a burrow, in the mountains of Colorado. 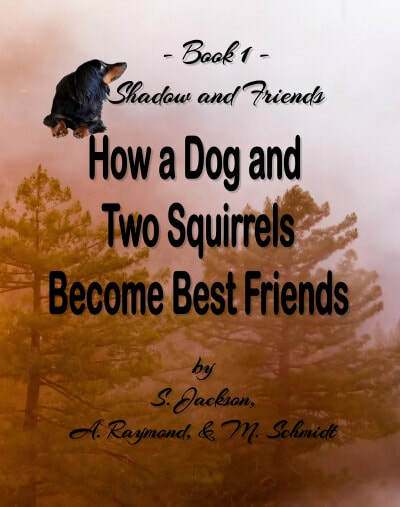 Shadow, a dog, and Uncle Stubby, a fox squirrel, and their friends go on a trip to visit Uncle Stubby’s cousin, Cousin Rocky, a ground squirrel. Cousin Rocky takes them skiing, teaches mountain safety, how to ski safely on the bunny slopes near his burrow, the difference between tree squirrels and ground squirrels, home safety, travel safety, and to watch out for cars. This story provides children with knowledge about different squirrels and their habitats, and teaches children safety when visiting a new place illustrating how important safety is, and promotes new adventures at the same time. In Shadow and Friends European Vacation, a small dog named Shadow wins a free trip to Europe because of all of her books that teach children safety at home, and during adventures. Shadow is allowed to take five friends with her on this fabulous trip, and she chooses to take five squirrel friends. In this delightful and funny book for children, safety is taught through the hilarious antics of her friends. Throughout this story of teaching children about historical areas and places in Europe, squirrel antics keep children entertained, and safety is learned. Targeted at ages 4-11, this book is easy to read and perfect for home or classroom. This story illustrates a few of Europe’s fascinating features with illustrations for children and adults. 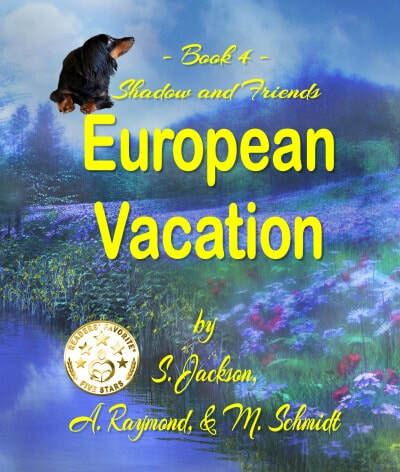 “Shadow and Friends European Vacation is the fourth book in the Shadow and Friends series written by S. Jackson and A. Raymond. As a reward for all her hard work in publishing books which teach safety to children, a small dog named Shadow wins a trip to Europe, not only for herself but also for five of her closest friends. With her favorite squirrel friends (Stubby, Foxy, Big Whitey, Little Whitey and Pilot) in tow, Shadow arrives at Heathrow Airport, London, before touring the city on a double-decker bus. A tour of The Tower of London and Big Ben are both on the agenda, as are Stonehenge, The Eiffel Tower and more. After visiting the UK, France, Germany, Italy, and the Vatican City, and learning special facts about the animals and tourist attractions in each country, Shadow and his friends board a plane and make their way back to the United States, excited to have learned so much during their European journey. 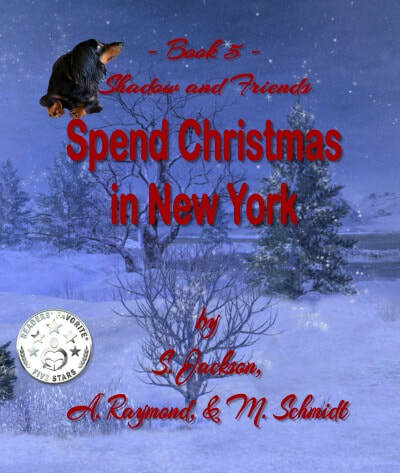 In Shadow and Friends Spend Christmas in New York, a fox squirrel named Stubby receives an invitation from his twin, Shorty, to spend Christmas with him and his squirrel family and friends in Central Park. Stubby invites Shadow, a small dog, and his squirrel family to go with him. They board the Rodent Road Adventure Tours jet, flown by Pilot, and Shorty greets them with a hello from atop the Empire State Building as they fly past! Not only do children learn safety and are introduced to the Eastern Gray Squirrels that range on the east coast of the USA, they have many fun adventures. In this delightful and funny book for children, the squirrels and Shadow learn about the huge Central Park in the middle of New York City. Children are entertained by the adventures of the group as they build a snowman, and Foxy goes shopping at Saks on Fifth Avenue. They decorate a Christmas tree, go ice skating at Rockefeller Center, and decorate a float for the annual Central Park Christmas Squirrel Parade! Add to this mix a few rocking horses, teddy bears, nutcrackers, candy cane castle, angels, elves, and a manger scene, and children are entertained. On Christmas Eve, all of them go to the Central Park Chapel, and celebrated the birth of baby Jesus! Targeted at ages 4-11, this book is easy to read and perfect for home or classroom. This story illustrates how beautiful Central Park is in winter, and the illustrations will fascinate children and adults. 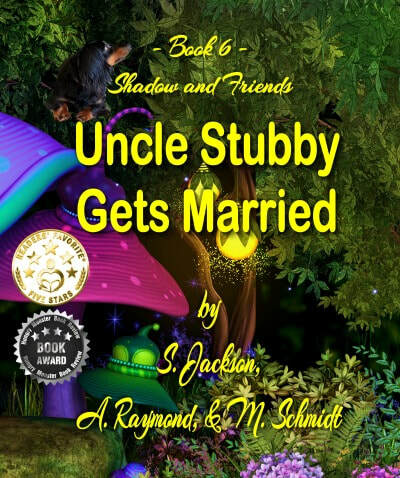 In this children’s picture book, and sixth book in our ‘Shadow and Friends Series’, Uncle Stubby Gets Married, a fox squirrel named Uncle Stubby has fallen in love with a girl squirrel named Sparkles. Squirrel family and friends, including a small dog named Shadow, and her boyfriend, Max, are invited to attend the wedding in a special Valentine Fairy Forest. Uncle Stubby thinks Sparkles is the most beautiful girl squirrel in the land. Uncle Stubby’s twin, Shorty, flies in from New York City with his family, and Shorty is best man for his brother. Foxy is matron of honor for Sparkles. The Valentine Fairy Forest is truly a magical land, the illustrations show how this dream forest looks, and all the animals are safe in this forest both day and night. Along the way, we meet mouse fairies, and Minister Mouse conducts the wedding. Sparkles’ wears a crown, and Uncle Stubby is dressed in a cummerbund. Various other animals are present, including one unicorn, and the bride and groom spend their wedding night in Walnut Forest, a special part of the Valentine Fairy Forest. Children will love seeing how magical the forest is, with abundant sparkles thrown in for good measure. This delightful and funny book for children, targeted at ages 4-11, is easy to read and perfect for home or classroom. This story illustrates how beautiful the Valentine Fairy Forest looks, produces pure imagination in children, and the illustrations will fascinate children and adults. 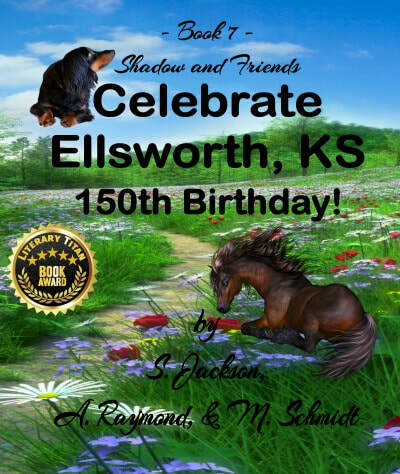 Shadow and Friends Celebrate Ellsworth, KS 150th Birthday! In The Big Cheese Festival, we meet Stubby Mouse and his family and friends. We learn that Stubby Mouse has a secret, that he is being bullied by another mouse, simply because his tail is short. Read how Stubby Mouse stood up for himself, and how he ended the bullying, in this delightful story for children. Targeted at ages 4-8, the book is easy to read and perfect for home or classroom. Children learn how bad bullying is, and what they can do to help stop bullies! Stubby Mouse encourages children to take a stand against bullies, and always be kind to each other. This story illustrates how everyone is different and unique, and it is a delightful read with cute illustrations for both children and adults. Take a stand against bullying today! Suzy Has A Secret teaches a child, ages four to eight years-old, about personal safety and body ownership. Children learn how to identify who safe adults are in a child’s life. This book shows in positive and practical ways how parents, and educators, can talk to children about personal safety. Children learn about bad touch and good touch, and how their body belongs to them. Parents and educators can help children learn who the safe people are in their lives, and that they can always tell one of them about anything that may happen, and they aren’t comfortable about. Using little bug fairies and fairy houses, ensures that children aren’t scared when this story is read to them, or they read it on their own. 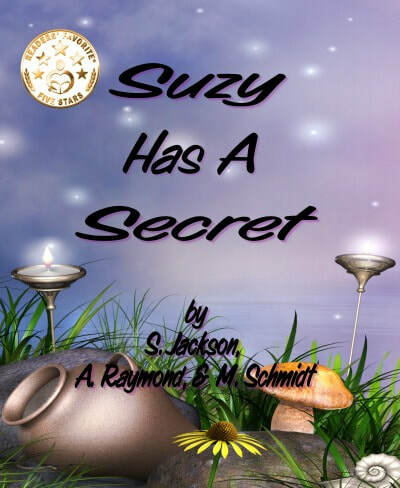 “Suzy Has A Secret” is a must read book for those with small children or for those that have little ones in their life. Children don't always know when or who to tell. We teach them to respect their elders and be quiet when asked; to behave and not to tattle. This needs to change! “Suzy Has A Secret” explains to children that we must always tell our parents or others when something doesn't feel right. I recommend this book highly. This is a great book for children, parents, and educators alike! Those with little ones in their lives should read this book for the valuable information it has regarding good touch/bad touch. I highly recommend this book, and the illustrations for the children’s portion look great! This book is a picture book showing America’s beautiful national parks through photographs and text, along with a few backyard squirrels thrown in for good measure. It has been fun and educational for both of us and we hope our book will highlight our nation’s national parks for others to enjoy and read about as well as to go and see our parks in all their beauty. 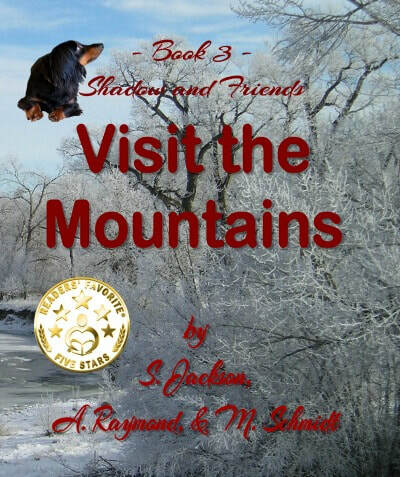 This book is extremely educational for people of all ages; it shows the beauty of our national parks in the United States while using fox squirrels to keep the attention of the younger readers. A collection of eighteen different recipes that have withstood time and generations of use. We hope others will use this collection of recipes in the many years to come. "I loved all the recipes. The bread recipe was delicious! Nice to know the recipes are tried and true!" This book contains 40 works of art from the M Schmidt Photography Gallery for others to enjoy. Mediums used include photography, traditional watercolour and oil paintings, as well as a series of digital selections mostly using bamboo and water color or ink stains, and a selection of surreal works. We hope you enjoy the serenity and tranquil feelings of contentment that we derive from our works.